A new art rental exhibition, curated by Adelaide-based specialist Art Logic, has been “turning heads and creating conversations” at the offices of BDO Accountants in the Adelaide CBD, according to Art Logic principal, Jacqueline Mitchell. space has no negative connotation. It's actually a smart artistic tool and refers to the space around and between the sculptures,” Jacqueline says. “Inspired by the landscape of the Australian Outback, Wellmann uses Negative Space to his great advantage, creating metal sculptures which use the space not filled as part of the finished work. The familiar shape of humanoid figures makes use of the viewer’s natural assumption of form, whether that form is outlined, filled or only suggested. eye. With these choices, the pieces can become as large or small as the viewer decides, as the backdrop becomes part of the sculpture. Potter-turned-mixed-media artist, Yuro Cuchor is flexing his artistic muscles with pieces that blend painting, sculpture and technology to create interactive works which respond to the viewer, according to Adelaide-based art innovator, ART LOGIC. “One of Yuro’s works entitled ‘Soda’ brings to mind the wonderful fizzle of bubbles beneath your tongue has been purchased for ART LOGIC’s collection: /artist/yuro-cuchor/soda,” says principal, Jacqueline Mitchell. “Yuro owned and managed a successful commercial and artistic ceramics workshop with 8 employees for 15 years in Slovakia before love brought him to Adelaide. “Once in Adelaide he changed tack. He added another three years of University study to his six years of study at the Bratislava School of Applied Arts and developed an innovative way to combine laser-cut acrylics with LED lighting and paint - with stunning results. “He recently joined ART LOGIC’s stable of artists providing works of art that contain fans, LEDs, UV lighting and movement sensors – and those are just the electrical components. Paints, MDF and textured acrylic round out the materials list for ‘Soda’ – a piece that literally looks back at you. “Interactive art has been developing since the dawn of time, and each artist’s take on the limits and rewards of such works builds onto the rich history of the form. Bringing such pieces as Yuro’s into the world of corporate art redefines how we as viewers and workers interact with the world around us, especially the environment that we work in. South Australian-based art leasing specialist, Art Logic has enrolled sci-fi artist Graham Shaw as its latest gallery attraction. Art Logic founder, Jacqueline Mitchell says Graham, a multiple award-winning artist, presents whimsical pieces inspired by the ‘retro’ version of science fiction aesthetics, developed from his love of the genre as a young boy. Using metal and plastic objects found in second-hand and charity stores, he creates new and interesting pieces of art which explore our views on science fiction, ranging from our fears to our hopes and capturing everything in between. 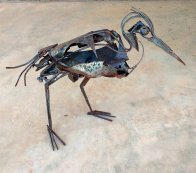 Graham studied at the Perth College of Art from 1975-78 and has been creating metal sculptures for almost 15 years, selling them across Australia and exhibiting widely. Turning a passion into a business is not new. But seeking to evolve world peace through art just might be. With 25 years overseas, a decade of corporate adventures, a masters degree and fluency in 3 languages to fall back on, Jacqueline Mitchell decided to challenge her latent entrepreneurialism. Art Logic, Jacqueline’s art rental and advisory business has three key objectives. To enhance work environments by providing alternating art; to support local artists by sourcing space outside galleries for their work; and to push people’s perceptions of what constitutes art. Jacqueline says the grass roots idea has seen her develop workshops and greater corporate interaction with artists; communication that would be normally reserved for art aficionados and gallery visitors. Seeing herself as a ‘corporate curator’, she explains that art education is integral to personal and business betterment. The curated exhibits can reflect any image a company wants to portray, that it is fun, connected and challenging for instance. Jacqueline says games such as matching an artwork with a list of random titles explores people’s views about art and can provide great conversational topics in the workplace. Artist talks and quizzes, held during a lunch hour or as part of team management, mean that renting art can provide much more than just an interesting backdrop. Using gallery hanging techniques, Jacqueline also ensures that a variety of art can be accommodated without damaging walls or rearranging spaces. Artworks range from traditional canvas to sculpture, multi-media, industrial design, installations, lights and -somewhat contentiously- graffiti art. Jacqueline works with more than 40 South Australian artists and the number is constantly rising. This diversity means exhibition space is not restricted to foyers. In addition, art rental fees are tax deductible as a business expense. And does Jacqueline really believe that people can be brought together through art? You bet she does. She has seen it in action. “World peace may be a lofty ideal,” smiles Jacqueline, “but seeking to have people better understand each other and appreciate alternative views does bring about office harmony. The extension of that gained tolerance and understanding filters through to communities, countries and, ultimately, the world.” What a change of art! Gayle Buckby (left) of QED is renting a collection of art from Sina Grasmann (centre) and Jacqueline Mitchell of Art Logic. When it comes to corporate success, economist and interpreter Jacqueline Mitchell advocates mixing business with pleasure. Through her art rental business, Art Logic, she encourages businesses to make art part of their wallpaper to “expand people’s vision”. “I want to help create a world where people are peaceful and happy, for that to happen they need to be in touch with their creativity,” she says. Hanging art in the workplace, she says, inspires and challenges people, and provokes discussions between colleagues about something other than work and the weather. Jacqueline moved to Adelaide about four years ago after spending 25 years overseas, living mostly in Europe. She studied and taught economics at Munich university and was a conference interpreter based in Brussels – she is fluent in German, French and English. She admits it’s been a “challenge for an academic to run a business”. Jacqueline has a portfolio spanning street artists, illustrators, abstract and figurative painters, as well as sculptors and photographers – they include Dean Howarth, Ann Newmarch, Zoe Freney, Leo Neuhofer (also ceramics) and KAB 101 and sculptor John Woffinden. Art Logic chooses a mix of works to suit each client, installs the collection and changes it every four months. Jacqueline believes renting art is a way for businesses not only to create a thought-provoking space but help support South Australian artists. Art Logic can be contacted on 0432-924-305.